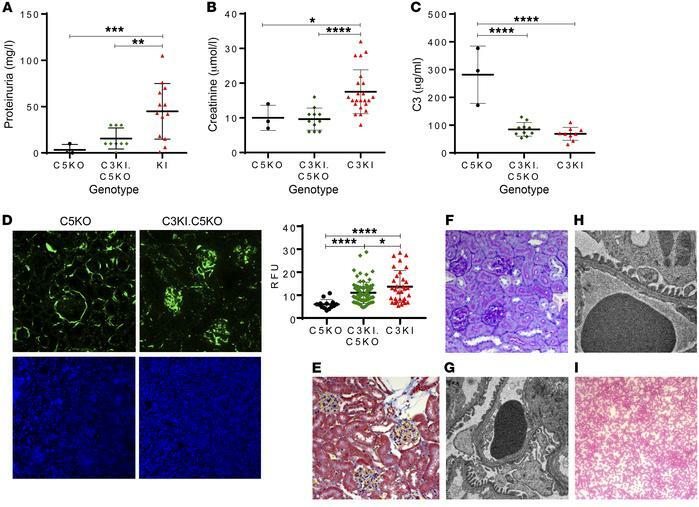 C3KI phenotype is rescued through genetic deletion of complement C5. (A) Proteinuria measurements of urine collected from 3 C5KO mice premortem (black circles) and, 9 C3KI.C5KO mice at 6 months of age (green diamonds) as well as, 12 C3KI mice on P21–P28 (red triangles). (B) Creatinine values obtained from 3 C5KO mice, 10 C3KI.C5KO mice at 6 months old, and 19 C3KI mice. (C) Plasma C3 levels. (D) Immunofluorescence of glomerular C3 deposition (upper panels; original magnification, ×20), with densitometry analysis of C3 deposition to the right, and with anti-C9 antibody (lower panels; original magnification, ×10). (E) MSB stain of C3KI.C5KO 6-month-old mice; original magnification, ×20 (representative of n = 8 examined). (F) PAS-stained sections of C3KI.C5KO 6-month-old mice showing normal glomeruli; original magnification, ×20 (representative of n = 8 examined). (G) Electron microscopy of a 6-month-old C3KI.C5KO mouse showing normal glomerular basement membrane and no evidence of dense deposits; original magnification, ×6000 (representative of n = 4 examined). (H) Electron microscopy of a 6-month-old WT mouse showing normal glomerular basement membranes; original magnification, ×10,000 (representative of n = 4 examined). (I) Diff-Quik–stained blood film of a C3KI.C5KO 6-month-old mouse showing no evidence of fragmented red blood cells; original magnification, ×10 (representative of n = 8 examined). *P < 0.05, **P < 0.01, ***P < 0.001, ****P < 0.0001. Unpaired t test (C) with Welch’s correction (A, B, and D).